Plant cells have a rigid cell wall outside the cell membrane. Animal cells have no cell wall outside the cell membrane. Plant cells have plastids; specialized organelles that synthesize nutrients using carbon dioxide, water and a bit of sunlight. Animal cells don’t have plastids. Centrosomes and centrioles are present in animal cells (near the nucleus) where they play a key role in cell division. Plant cells lack centrosomes and centrioles. Lysosomes (membrane-bound organelle that contains digestive enzymes) are present in animal cells and absent in plants. Note: some plant cells have been found to contain vacuole that share some properties of the lysosome. 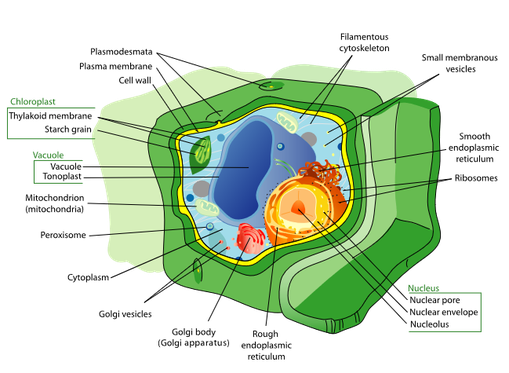 The huge central vacuole in plant cells is usually the largest organelle in the cell. Animal cells have few tiny vacuoles. They are both classified as eukaryotic cell. 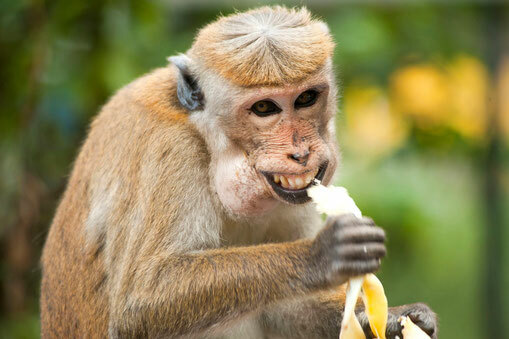 This means they have a true nucleus - their DNA is housed in a protective nucleus. They are generally larger than prokaryotic cells (or prokaryotes) - cells with neither a distinct nucleus nor membrane-bound organelles. Prokaryotes are unicellular microbes such as bacteria. They both have membrane-bound organelles - an outer boundary that separates the organelle from the rest of the cell. Examples of membrane-bound organelles are mitochondria, chloroplasts, lysosomes, rough and smooth endoplasmic reticulum (ER), golgi apparatus and vacuole. They have several organelles in common. These have the same (or similar functions) in both plant and animal cells. 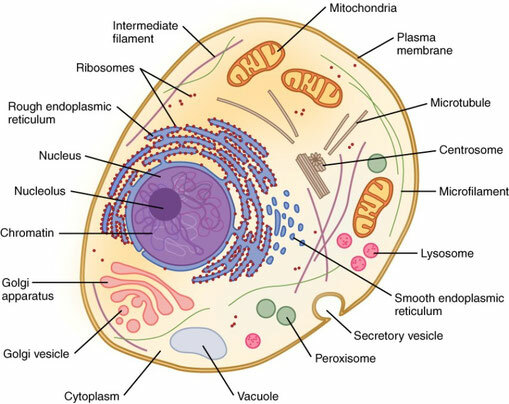 The following organelles are common to plants and animal cells: nucleus, ER, mitochondria and golgi apparatus, plasma membrane (aka cell membrane), cytoskeleton (*a network of filaments and tubules in the cytoplasm, cytoplasm (*a jellylike material inside the cell). And these organelles in animal cells that are absent in plant cells: centrosome, lysosome, small vacuoles, cilia and flagellum. The plant cell is enclosed by a thick rigid cell wall made of cellulose. The animal cells is enclosed by a 'squishy' cell membrane. This is one of the reasons why plants can't dance or play hopscotch. However, Mother Nature always make room for exceptions. There are some weird plants that can move to a certain extent, a few of them are carnivorous. Their ability to move helps them catch their prey. As you have seen, even though the ability to move one's self is a trademark of the animal kingdom, plants are slowly catching up. The flexible cell membrane around animal cells gives them the ability to be arranged into a variety of tissues, complex specialized organs and body systems. This is why animals have complex organs like the heart, kidney, lungs, and have enough flexibility to move around looking for plants to eat. Before you think about declaring your superiority over plants, you should know that plants have an amazing superpower. They do not require a hamburger or cheeseburger to keep them going. 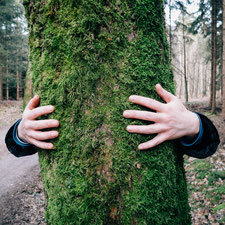 Plants have the ability to make their own food from scratch using carbon dioxide, water and a bit of sunlight. The organelle that gives plants this amazing ability is called plastid. They organelle is absent in animal cells. One of the most important plastid is the chloroplast which contains the green pigment, Chlorophyll. Chloroplasts use carbon dioxide, water and sunlight to make sugar and oxygen through a process called photosynthesis. The green parts of plants, such as the leaves, non-wooden stems and unripened fruits are packed with chloroplasts. Chlorophyll makes plants green. In addition to making food for themselves and for us, plants play an important role is cleaning the atmosphere. They mop up carbon dioxide and release oxygen for us to breath. It is hard to imagine life on earth without plants. Everything you've ever eaten is either made from plants, something that ate plants or something that ate something that ate plant. This is why plants are the foundation of the food pyramid. Cells in the lungs and throat have tiny moving hair-like arms called cilia which flip and push mucus up and out of the lungs. The human sperm cells have a long whip-like tail called the flagellum. The sperm cell uses its tail to move around in search for an egg to penetrate and fertilize. Cilia and flagella don’t occur in plant cells. As already mentioned, there are different types of animal cells. They differentiate and specialize in order to perform different functions: Cells in the cornea of the eye are transparent while those in other parts of the eye aren’t transparent. The elastic nature of muscle cells gives them the ability to contract and relax. Plant cells have a large central vacuole filled with water. The central vacuole can take up to 90% of the cell’s volume. It creates turgor pressure which reinforces the already stiff cell wall. This is why raw (fresh) carrots are crunchy when we eat them. When they stay in the refrigerator for too long, they loses water and the turgor pressure drops leaving the carrot ‘floppy’. The vacuole also acts as a water storage container for dry seasons. It also plays a role in excretion and transporting waste. Animal cells have tiny vacuoles, much smaller than the central vacuole in a plant cell. 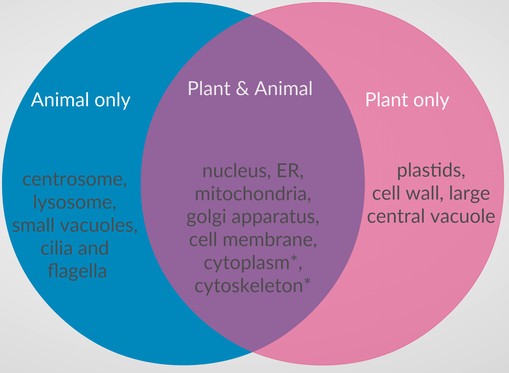 Vacuoles in animal cells have no structural function. Centrosomes are paired structures that play a crucial role in building and organizing microtubules during cell division in animal cells. Centrosomes are absent in plant cells, except for some primitive plants species such as mosses. Higher plants rely on other structures to build and organize microtubules during cell division. Lysosomes are membrane bound organelles (vesicles) filled with hydrolytic enzymes. Lysosomes are part of the demolition and recycling crew of the animal cell. They help destroy and recycle of old organelles. When a foreign body such as a microbe is ingested by the cell, a lysosome fuses with the vesicle containing the microbe and delivers its destructive enzymes to kill and breakdown the microbe. Lysosomes can only be found in animal cells. However, some vacuoles in plant cells have been found to perform functions similar to a lysosome. After reading all these stuff, you should not only have a good understanding of the similarities and differences between plants and animals, but also an appreciation of the work plants do to make food for us to eat and air for us to breath.